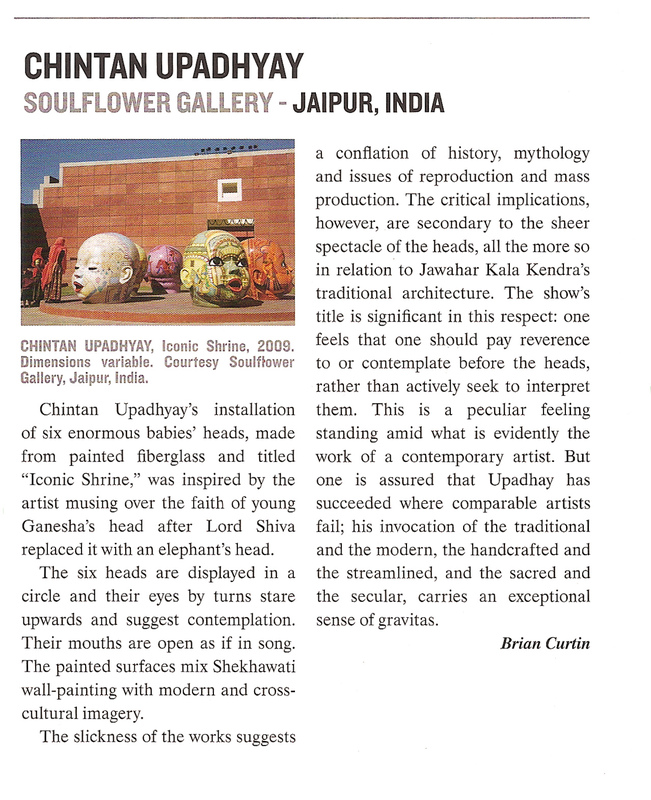 Gallery Soulflower Bangkok presents ICONIC SHRINE new paintings and sculptures by CHINTAN UPADHYAY. Chintan Upadhyay’s paintings and 3D works have a streamlined perfection that signifies mechanical reproduction. Colors can be garish and while his artworks often appear playful they nevertheless have disturbing undercurrents. The artist focuses on particular motifs most recently the image of babies and includes fragmented references to local Indian culture. The affect is typically one of a brash visual overload like advertising imagery that makes explicit an otherwise implicit vulgarity. Upadhyay is concerned with the nature of the designed: contemporary technologies of replication. The image of the baby or infant is an appropriate symbol. It can represent innocence and is understood as typifying the natural. In Upadhyay’s terms both these states have become obsolete in our age of globalized values and because of a pervasive sense of the simulacral. In a word we are divorced from the realm of the real or authentic. Upadhyay renders aspects of Rajasthani miniature paintings as tattoos on some of the figures he paints to suggest history and identity are markers that are consciously worn. That is cultural and social understandings are claimed as not emerging inevitably or naturally. Upadhyay’s art however is not one of a crisis of contemporary values. And he is certainly not concerned with nostalgia for more authentic times. Rather and like much of the best of international contemporary art his artworks serve a critical prompt about the world we live in. On 16 and 17 February artist Chintan Upadhyay will have a preview of his works in Jaipur at Jawahar Kala Kendra. The works will be part of a traveling exhibition titled Roundabout featuring over a hundred international artists and will travel to New Zealand Australia Israel among others. The main exhibition opens in September 2010 and will travel for at least two years. The exhibition is a metaphor for hope and rebirth and works on the idea that what goes around comes around. It brings together artists from all over the world who have never exhibited together in the same space and hopes to start a dialogue amongst them through their work. Chintan is one of the Indian artists who will be part of this exhibition which also features artists like Julian Opie Kevin Francis Gray Wang Qingsong Shane Cotton etc. 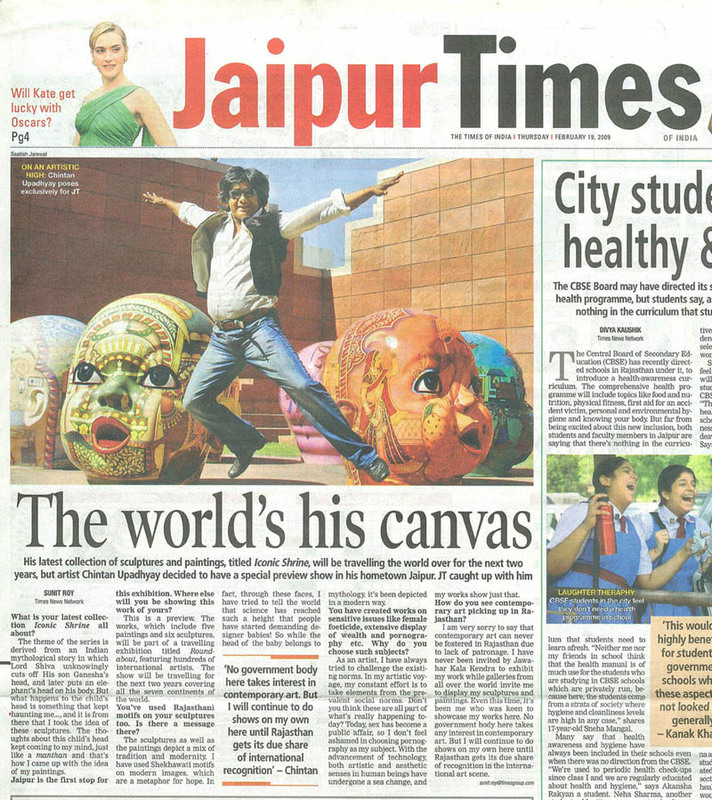 Roundabout will be hosted in some of the major museums around the world and Chintan will participate with six large sculptures each 5 x 5 x 5 feet and five paintings each 6 x 6.5 feet for this exhibition. As an artist Chintan has constantly challenged the established norms having developed his own language to communicate with his audience. These works are a further exploration of this language. The works are about a merging of tradition and modernity having influences of Shekhawati wall paintings along modern day images. The preview opens on 16 February and will be inaugurated by eminent artist Laxman Shrestha. It is in collaboration with Gallery Soulflower Bangkok and the organizers of Roundabout. Gallery Soulflower is the first gallery in Thailand specializing in contemporary art from the subcontinent of India. The main mission for the gallery is to push the potential of contemporary art and capture the current directions of the rapidly developing visual culture thereby delivering a direct experience of the art of our time. There are no artistic boundaries as to the kind of art works the gallery intends to show for each art creation has its own merits. Works on display here can range from painting sculpture photography installations to new media and conceptual-based art. “ICONIC SHRINE” by CHINTAN UPADHYAY. ?????? 16 ?????????? 2552 ???? 17.00 ?. ??? ?????? ?? ?????? ???? ?